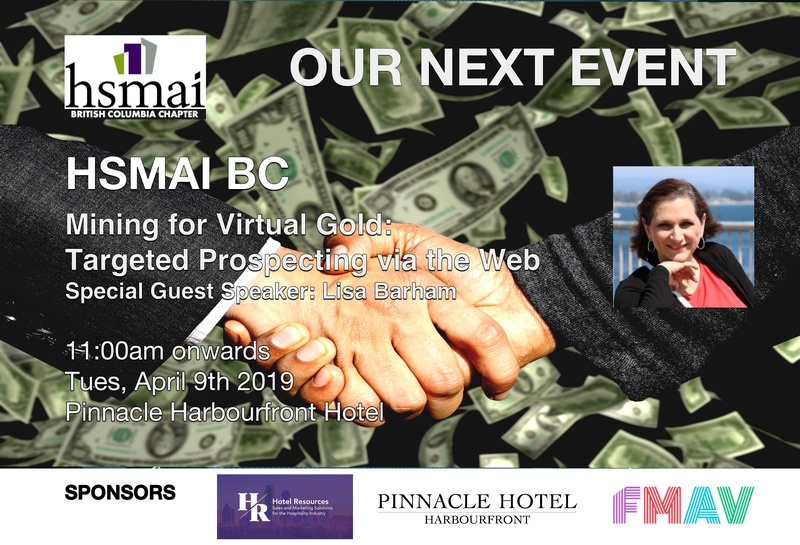 s hotel salespeople are looking for new leads to fill their pipeline for 2020 and beyond, Mining for Virtual Gold will give you the tools to prospect more efficiently and with greater results allowing you to dig up new leads and sales opportunities. Find groups putting their 2020 calendars together and call them before they book with a competitor. Uncover great travel tools to share with current and potential clients. Show your clients how to save money. This makes them happy and gives you a reason to call them each month with new cost saving resources. Determine where to start searching, taking into consideration market segments, industry opportunities and time of year. You will learn to “think” differently when setting up the search. Learn tips and tricks to simplify using search engines to get desired information more quickly. Have an enhanced awareness of the tremendous resources available on the Internet for development of new business. Work efficiently and accurately on the internet, utilizing time saving methods. Find out who is staying at hotels, conference centers in competitive markets. Find out what rates they are paying. Find business looking at your city before they book their events. Find e-mail addresses and contact names for mid-level staff in corporations. Find contact information on Meeting Planners from a corporation. Find databases for specific industries. Use hundreds of websites by market segment to find your next customer, the companies still holding meetings…energy, government, medical, pharmaceutical, biotechnology, nanotechnology, transportation, etc. in your state or city. Learn how to find past minutes to meetings, providing dates, locations for next meeting. Learn how to profile a key account or target account using research techniques. Take a key account and expand the meeting planners from 5 to 20 meeting planners. Simple easy way to set up a successful sales blitz. Please ensure you bring your laptop as you will actively be prospecting during the event. Lisa Barham, a native Texan, a business and marketing major from Lamar University, in Beaumont, Texas, has been in the hospitality industry for more than 18 years. She started her sales and marketing career while working for Metro Hotels. During the eight years that she worked in the hotel industry, she worked primarily in the corporate office, developing and facilitating sales and marketing programs for 33 hotels. Initially a reader board service, Hotel Resources is today, a company offering multi-faceted support for hotels sales and marketing. Services include: Reader board services in four major markets, organizing telemarketing campaigns and sales blitzes, internet completive research, competitive market analysis and teaching internet prospecting workshops for the hospitality industry. Founded by Lisa Barham, the company’s clients include every major brand hotel company and hundreds of independents as well as CVB’s and AV companies. For more information on Hotel Resources, visit their website at www.hotelresources.com.